In addition to serving you your favorite libation, the bar sponsors social events such as Game Night, Trivia Night, Open Mic Night and Karaoke Night. Some of our parties, like the Super Bowl and Kentucky Derby Day are centered around the bar. The Club serves brunch on Sunday, lunch and dinner five days a week. For details click here. Many of our members say the primary reason they joined was the ability to dance to live music on our 320 square foot hardwood dance floor. Almost every Friday night we have live music. Many of our parties also feature dancing. Members gather Monday, Wednesday and Friday mornings at 8:30 for an hour of water aerobics. The class is taught by a certified instructor. Classes focus on aerobic endurance, resistance training, and creating an enjoyable atmosphere with music. Any member is welcome to join us. You do not need any previous experience. All levels of physical ability are accommodated. Our Entertainment Committee plans numerous parties throughout the year. Some parties are holiday events and others are specific themes. The Club is decorated in keeping with the theme and may members arrive dressed accordingly. Some of our holiday parties include Halloween, Christmas, New Years Eve, Valentines, and St. Patrick's Day. Themed parties have included Murder Mystery Nights, Tax Payers Bawl, and Flower Power. Most parties include dinner and dancing to live music. There is no better place for fishing than the Florida Keys and here at the Marathon Yacht Club we are in the heart of it all. Each quarter the Club runs a fishing contest with prizes for the largest cobia, dolphin, grouper, snapper, wahoo, etc. caught. Members regularly get together for a day on the water. Big game fishing is only a few miles away in the Gulf Stream. Lobsters and crab can be caught within sight of the Club. Each year at the start of lobster season we get together to go lobstering and return to the Club for a dinner of the tasty crustaceans. 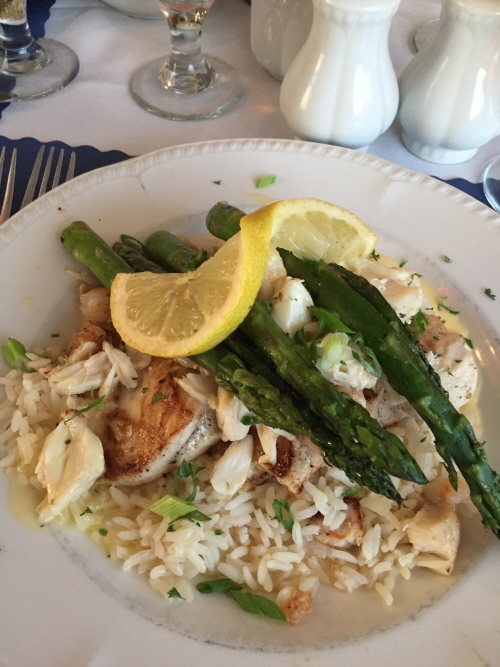 Our kitchen will be happy to cook your catch. Here is what our chef did with one. MYC has an active group of cruisers who take their boats to destinations near and far. Recent cruises have included trips to Key West and local anchorages. We periodically cruise to the Little Shark River and enjoy anchoring in the Everglades National Park. We have done the "south Florida Circle" going up the east coast to Stuart, across the Okeechobee Waterway, and returning to Marathon through the 10,000 Islands. We did a "Doc Ford Cruise" up the west coast of Florida visiting locations mentioned in the Randy Wayne White books. We have cruised to the Dry Tortugas. Each summer several of our members take their boats to the Bahamas. Our Fun Fleet organizes land cruises. Events have included a bus trip to the Miami Boat Show, lunch at local restaurants, miniature golf tournament, a bus trip to Gulfstream Park, and an annual event we call Cheeseburgers in Paradise which is a cookout at a members house. Some Fun Fleet cruises are held in conjunction with Fleet Cruises. Non boating members meet up with the cruising boats at points along their route. Contract bridge is played at noon on Wednesdays. On each Wednesday at 2PM during the season, November 1 thru April 30, we have a dealer's choice, $5 buy-in poker game. Wild games, tons of fun. Mah Jongg is a game that originated in China. It is commonly played by 4 players There are several variants. Here at the Club we play the American version. Mah Jongg is a game of skill, strategy, and calculation and involves a degree of chance. Join us on Wednesday's for lunch, camaraderie, and play.